Please call owner David at 989-370-9308. Great trailerable cruiser, solid fiberglass hull, fresh canvas curtains upholstery. Teak swim platform, refrigerator, sink, electric head. 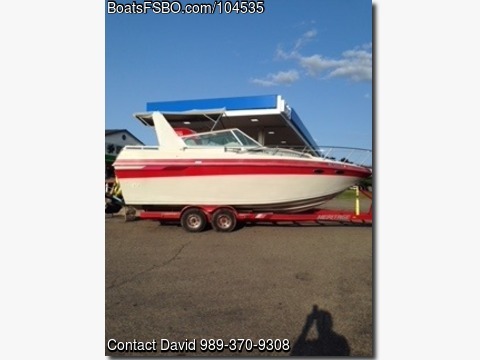 Refreshed 7.4 Mercruiser, New correct aluminum intake, exhaust manifolds risers, water pump. New camshaft, lifters, pushrods, roller rocker arms. Bravo I outdrive, SS Prop, new O.E.M. Drive components, including flexplate coupler. With bronze thru hull transducer. Original Heritage tandem axle trailer, Deck air conditioner.